This is a Thai braised beef restaurant in Bangkok that will satisfy all your beef dreams. 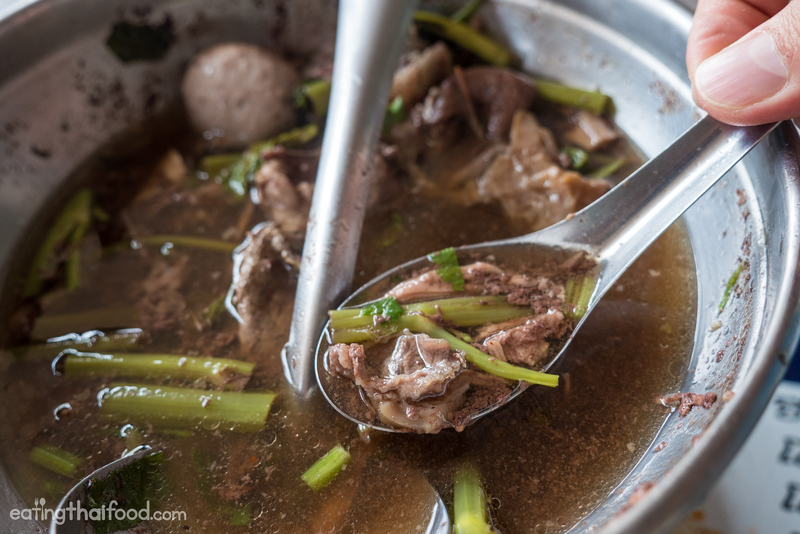 Neua Toon Tha Nam Sathu Pradit (ร้านเนื้อตุ๋นท่าน้ำสาธุประดิษฐ์) specializes in Thai Chinese style braised beef that’s so tender it melts in your mouth. 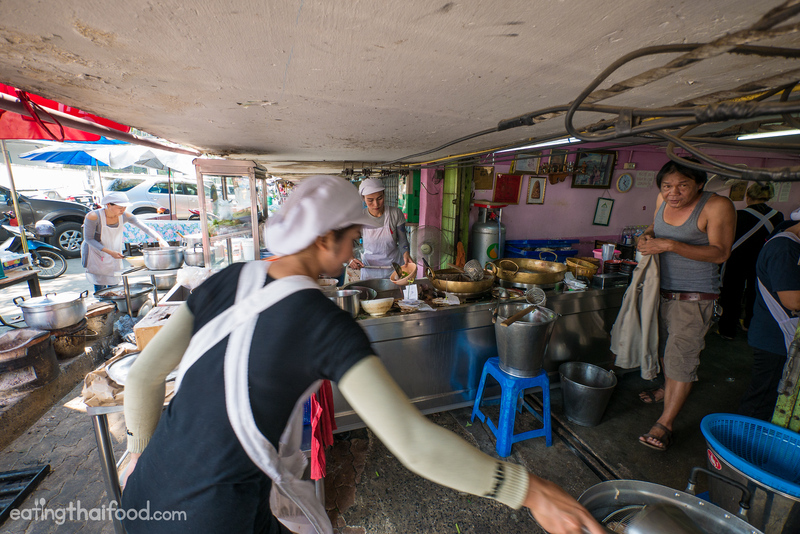 In this blog post I’ll share all the details of this amazing Bangkok street food restaurant with you. Press play on the video to watch this entire beef meal experience! 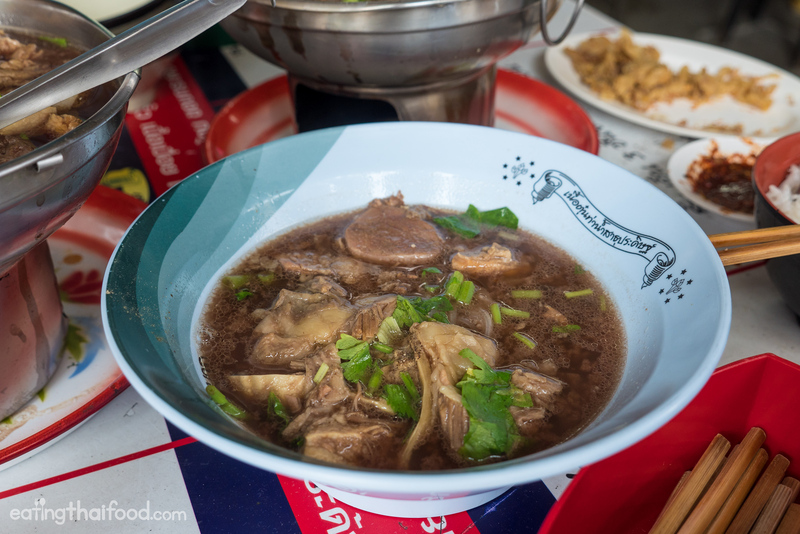 I have a lot of favorite Thai braised beef restaurants in Bangkok, including this beef fire pot spot and the legendary beef noodle jacuzzi, but Neua Toon Tha Nam Sathu Pradit (ร้านเนื้อตุ๋นท่าน้ำสาธุประดิษฐ์) just might top them all in Bangkok. 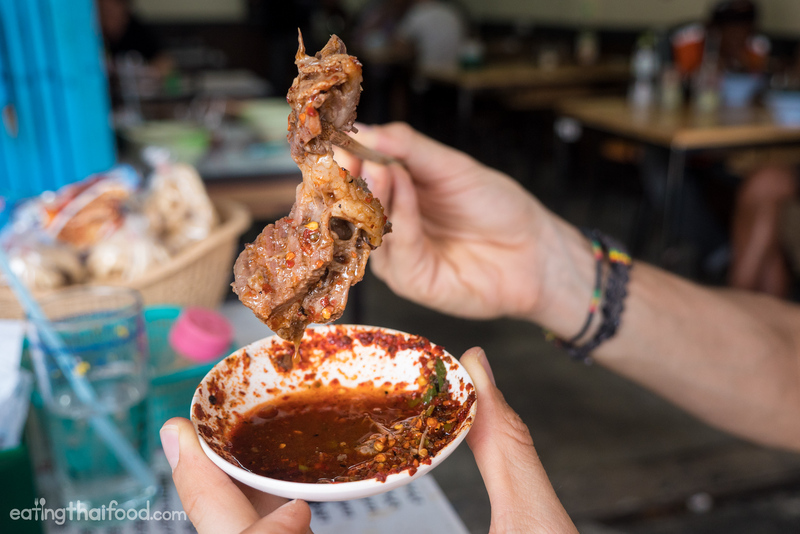 The restaurant actually translates to braised beef at Sathu Pradit pier, and not only is their braised beef outstanding, but I couldn’t get enough of the atmosphere either. The actual restaurant occupies about 4 or 5 shophouses in a row, but it’s all open air (so it’s kind of street food style), and there are also tables scattered around the outside patio area and the parking lot. All the cooking and braising of the beef happens at the corner of the building, which appears like it hasn’t been maintained in decades, and it’s oozing with character – I love the setting. You’ve go to appreciate random piles of beef! 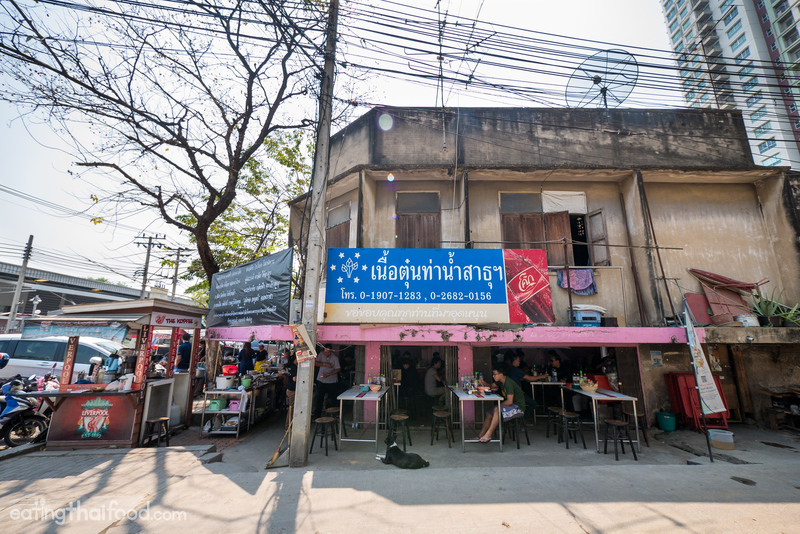 Another thing you have to love about Neua Toon Tha Nam Sathu Pradit (ร้านเนื้อตุ๋นท่าน้ำสาธุประดิษฐ์) is how low the ceiling is (if you haven’t already watched the video, you’ll get a much better idea of the lowness of the ceiling by watching it). But mainly, just don’t stand up too hard or too fast when you eat here. 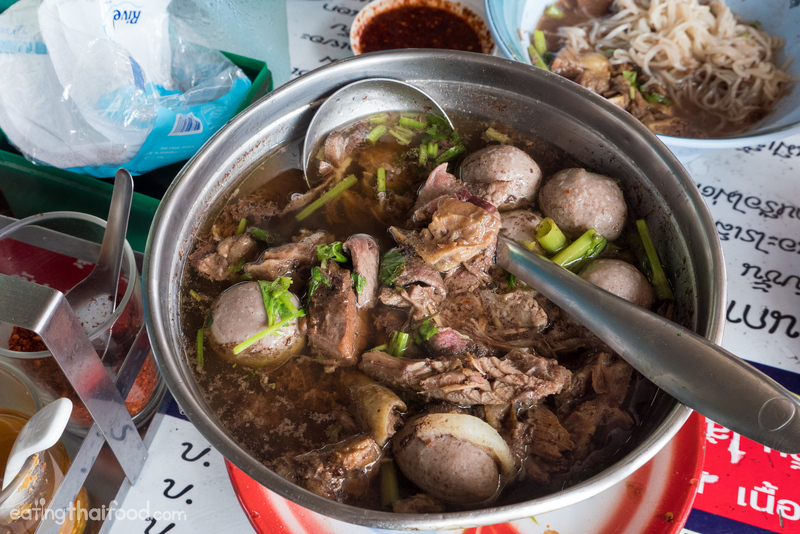 You’ll notice big pots of tenderly braised beef all around the restaurant, waiting for the masses of hungry beef lovers to come — it’s a true Thai Bangkok beef paradise. The menu has a theme: All the beef hot pots are named by education terms in Thai, according to the size. So you can order an elementary, a high school, all the way to a bachelors, a masters, or a doctorate beef pot and everything in-between. Each level of education is the size of beef fire pot you’ll get (perhaps the owners were in the education industry before moving over to beef!?). If you love tenderly braised beef! To order the biggest one though, you have to go inside the shophouse and eat at a special table where they have a gas burner attached to the bottom of it. So because I really wanted to sit outside on the patio, we ordered the Bachelors braised beef pot (ปริญญาทุกอย่าง), which came with a candle underneath. The pot came full of both braised beef and fresh beef, beef meatballs, tripe, and a few other random beef bits, all drowned in broth, and topped with Chinese celery, pepper, and fried garlic. The braised beef will melt in your mouth, and along with the salty umami studded broth, it will make your eyes close in a dreamy state of beef deliciousness. 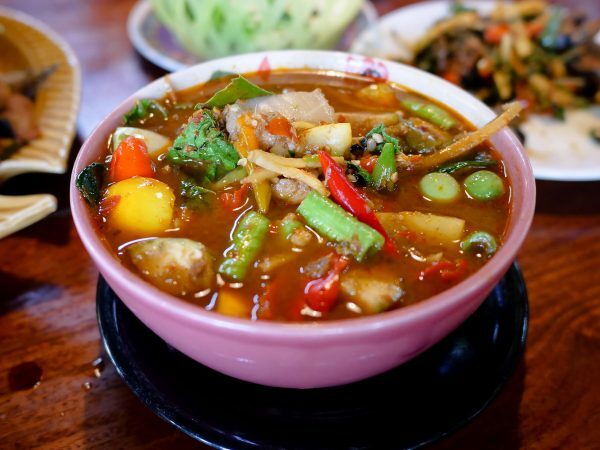 It’s one of those Thai Chinese beef stocks that has been slowly brewing, possibly since the beginning of the restaurant. Another thing Neua Toon Tha Nam Sathu Pradit (ร้านเนื้อตุ๋นท่าน้ำสาธุประดิษฐ์) is famous for is their fried pork skin (กากหมู kak moo), which they uniquely call moo huai (หมูห่วย). It’s similar to chicharrones, but not as puffy. 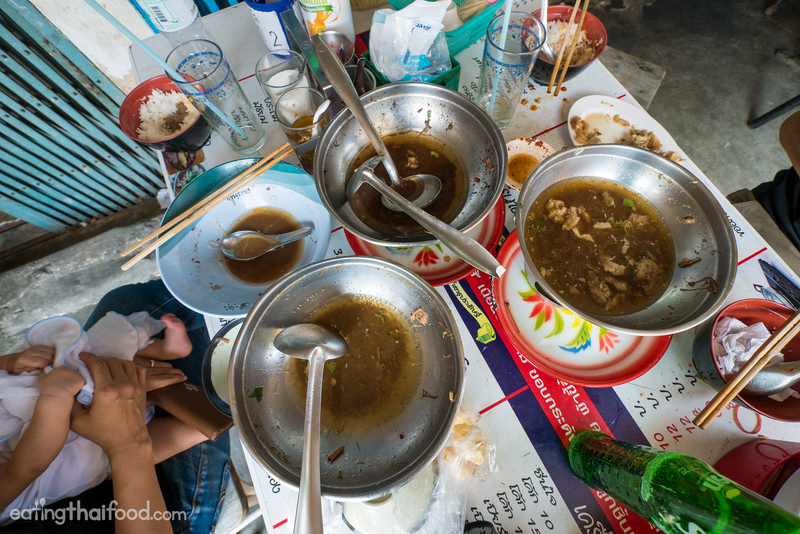 They were kind of like croutons for the beef soup, and although they were pretty oily, it would be a lie to tell you that they were not incredibly delicious and went so well with the beef soup. 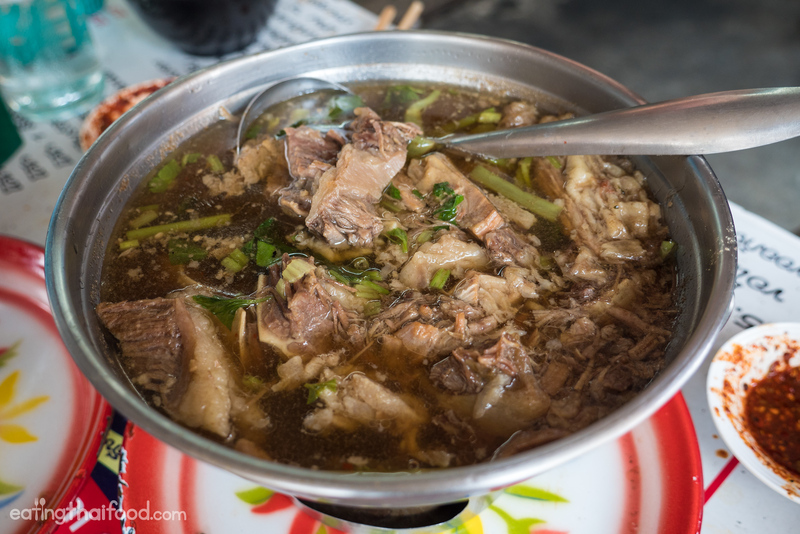 Like with most Thai braised beef, the soup of the beef is not prepared spicy. So it’s up to you to make your own sauce. On the table they have vinegar, chili flakes, fish sauce, and they even have a pink fermented tofu sauce as well. I went with my usual combination of chili flakes, vinegar and a bit of fish sauce to balance it off. 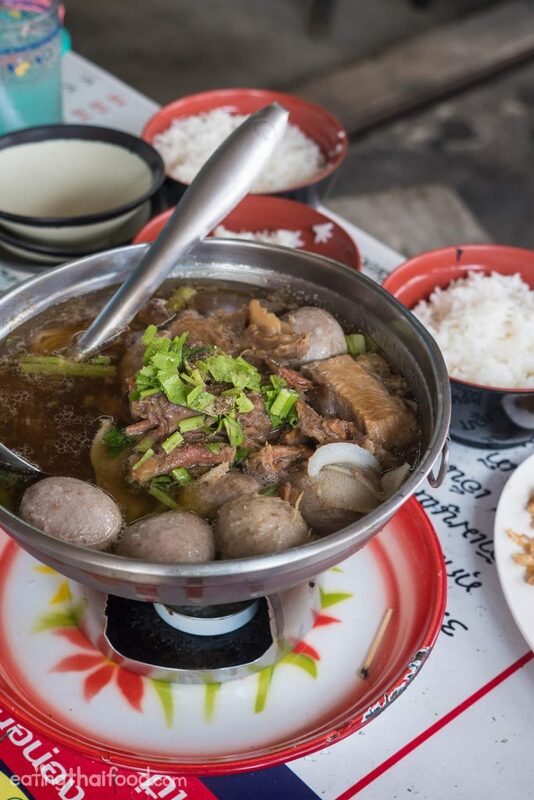 The simple combination, and being able to mix your own ratio of ingredients, is part of the fun when eating braised beef like this in Bangkok. Also, I don’t want to let the beef meatballs go under the radar here — good quality Thai beef meatballs have really been growing on me lately. The beef meatballs here are very good — quite large and smooth, yet very firm, and bouncy. 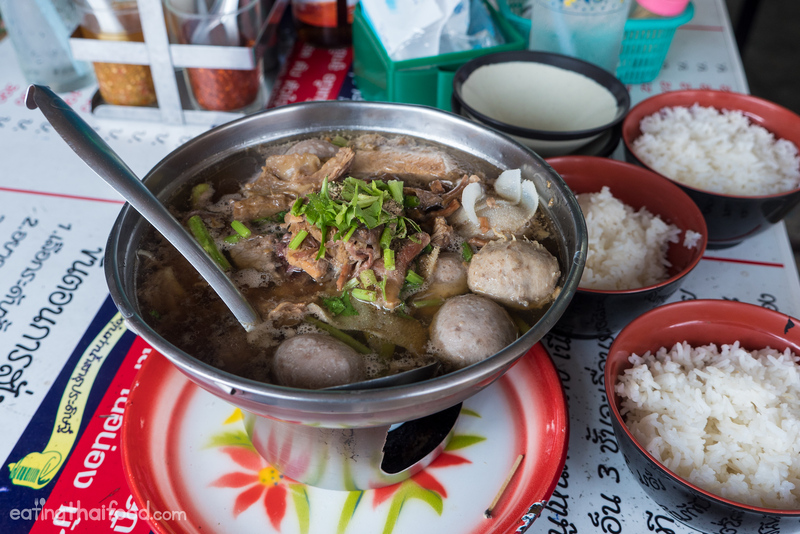 We couldn’t stop at one braised beef pot, so for our second, we ordered the same braised beef with all the fixings and all the parts, but this time with nam tok (น้ำตก), or extra blood in the soup. The broth will impress you! When she assembled it, she added some raw blood to the bottom of the pan before scooping in the hot soup, cooking the blood and making the broth even more thick and rich. Our second Thai braised beef pot was possibly better than the first one. You can see how rich and stunning that broth is at the bottom of our second pot. I’m still dreaming about it. I was pretty happy with only eating pots of braised beef… but for “research purposes,” I decided it would be a good idea to order a bowl of noodles with braised beef as well. A bowl of braised beef noodles would be a good option if you’re looking for a quick meal. The noodles were actually amazing because they soaked up some of that broth. But overall, I’m a rice kind of guy, so I liked the braised beef pots, with rice on the side the best. I think you might already be able to tell how much I loved the Thai braised beef at Neua Toon Tha Nam Sathu Pradit (ร้านเนื้อตุ๋นท่าน้ำสาธุประดิษฐ์). This was one of those meals, similar to eating Thai Jungle food at Long Riang, where I just couldn’t stop. We ordered one more pot of braised beef for dessert. This time, exclusively with braised beef, and extra blood in the broth. The beef, with its ratio of fat and meat, is fall apart tender, and it will literally just melt on your tongue. 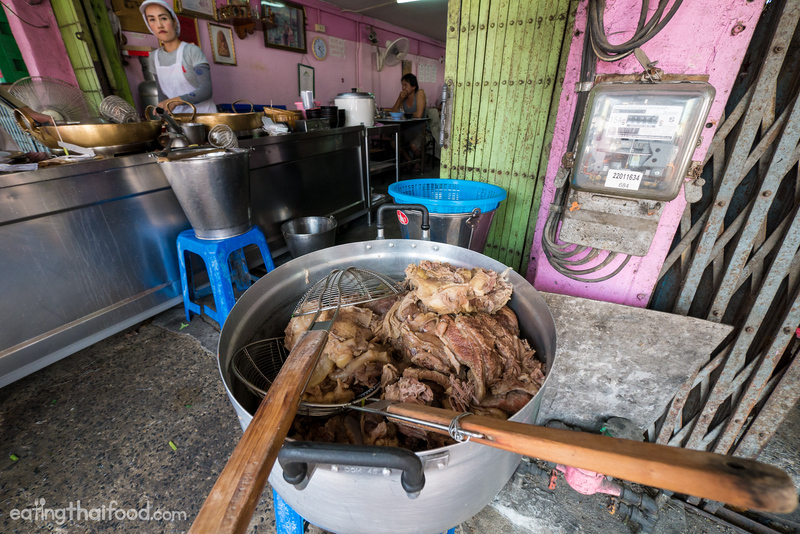 If you’re a beef lover, this is some Bangkok street food Thai braised beef that will awaken your taste buds. My wife Ying, my friend Joel, and I, ate this meal, and I would say we probably ate more than we should have — fueled by my excitement — and our total bill came to 888 THB ($25.15). Remember, don’t stand up too fast, or you will hit your head! 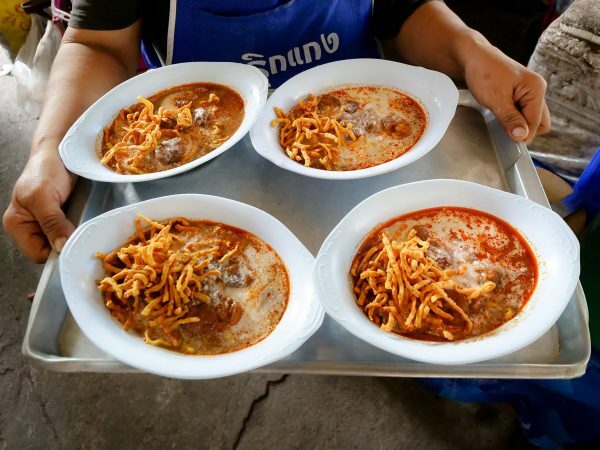 I’ve had a number of memorable beef meals in Thailand, including a rumen and bile filled beef meal in Udon Thani, but this was one of the best beef experiences I’ve had in Bangkok in a very long time. 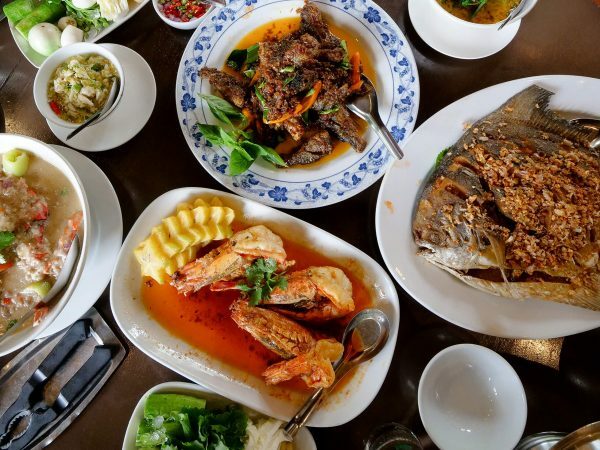 There’s no doubt that Neua Toon Tha Nam Sathu Pradit (ร้านเนื้อตุ๋นท่าน้ำสาธุประดิษฐ์) is a paradise for Thai beef lovers in Bangkok. You can either choose to order a bowl of noodles with braised beef, or choose your size of Thai braised beef hot pot to eat with rice. Not only is the braised beef incredibly flavorful and fall apart tender, but their beef meatballs, the tripe, and all the other goodies included are fantastic. 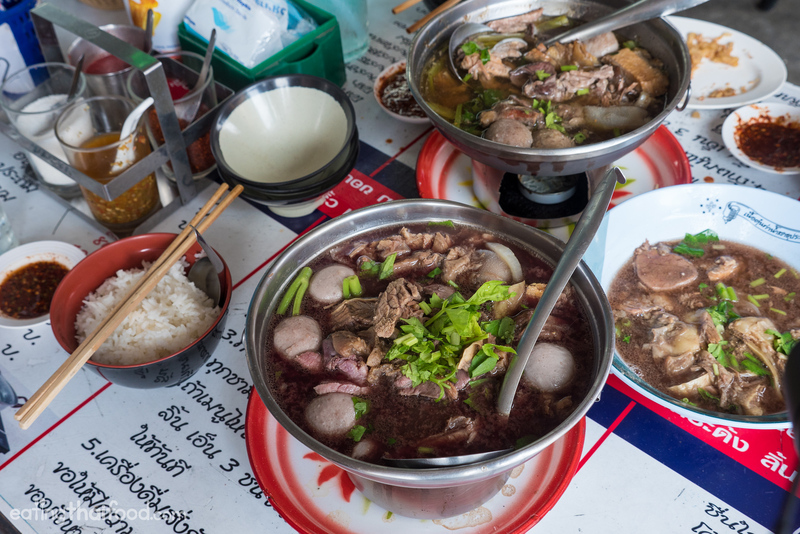 If you’re ready to eat some of Bangkok’s best braised beef, Neua Toon Tha Nam Sathu Pradit (ร้านเนื้อตุ๋นท่าน้ำสาธุประดิษฐ์) is a restaurant you don’t want to miss. Prices: It really depends on the size of braised beef you eat and how much you eat. Our entire bill came to 888 THB ($25.15). ที่อยู่ ตั้งอยู่ที่ 684 ท่าน้ำสาธุประดิษฐ์ แขวงบางโพงพาง เขตยานนาวา กทม. These pictures make me reminiscent of visits Bangkok 2015 ! Hi Mark, congratulation on such a milestone passing the 1million subscriber. i love eating, especially street food, your videos were phenomenal. This braised beef pot is looking deliciously wonderful, this is a real haven food on earth. I already book my plane ticket to Thailand this November. Wonder if the place still there. I had my first solo travel in 2015 just for 6 days in Bangkok but it was too short that I think I wasn’t able to get around. There are several places to explore. Yes, I’ve tried their food but not that much. Next time in few months, I want to go there again. I am excited to try these recommendations of yours. Bangkok, here I come! Hi Mark, I have seen the u tube of the delicious braised beef. As I am going to Bangkok with my hubby next month we would like to try the beef. Please let us know how to get there as we are staying at Bangkok City Hotel near Pyathai Station. Hope to here from you. of the street food places you recommended. They didn’t exist anymore. This seems so crazy. 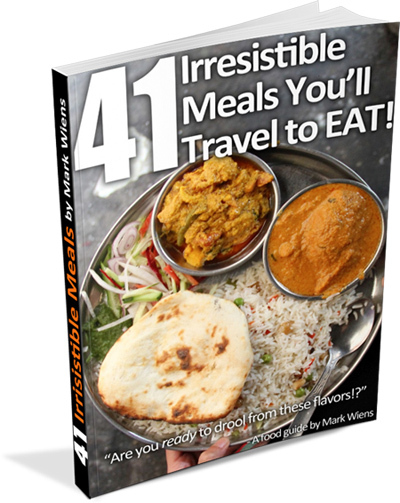 The #1 street food destination in the world without street food!!? They want to give the streets back to pedestrians. Won’t be any without street food. Street food has been a big part of your focus. It’s what got me to Bangkok. 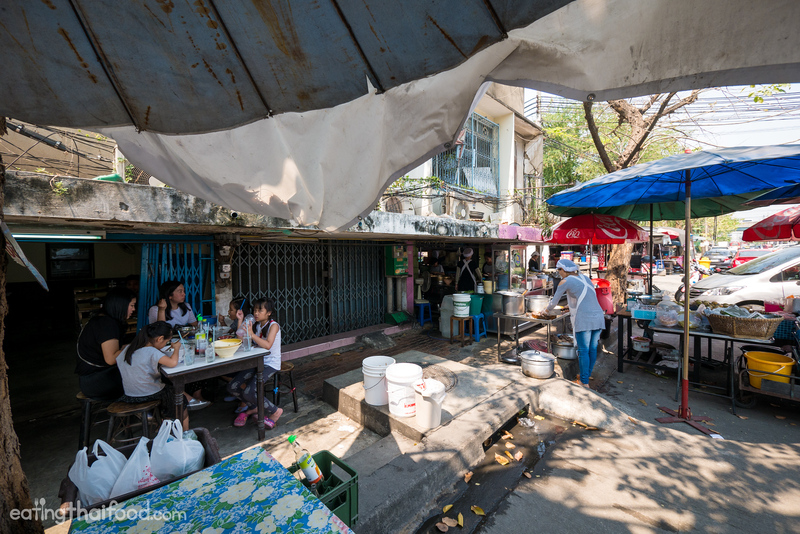 How will this change affect your food writing in regard to Bangkok ? Thanks for your information. I always watch your posts about food introduction. They’re really enjoyable and helpful. The beef is very attractive! I am going to visit Bangkok. I hope to try it. Can I get there by public transportation or only by taxi if I will stay in Chit Lom? I would like to try it next time I visit Bangkok may be in October 2017. But I will need some direction since the shop is away from BTS. I wonder can I take a boat ride from Taksin BTS since the place is by the pier. Hey Mark! I’ll be in Bangkok later this month and am salivating at the thought of savouring this during my trip. In your opinion what would be the best way to get here? Fantastic ! Just discovered this site. I love beef. Thanks for the video. When I visit Bangkok next time I sure will go there. Please tell me how to get there from Hualamphong station, thanks. I am visiting Bangkok again real soon. I love both beef briskets and fish balls. I do love “Beef Everything” with vermicelli in soup. 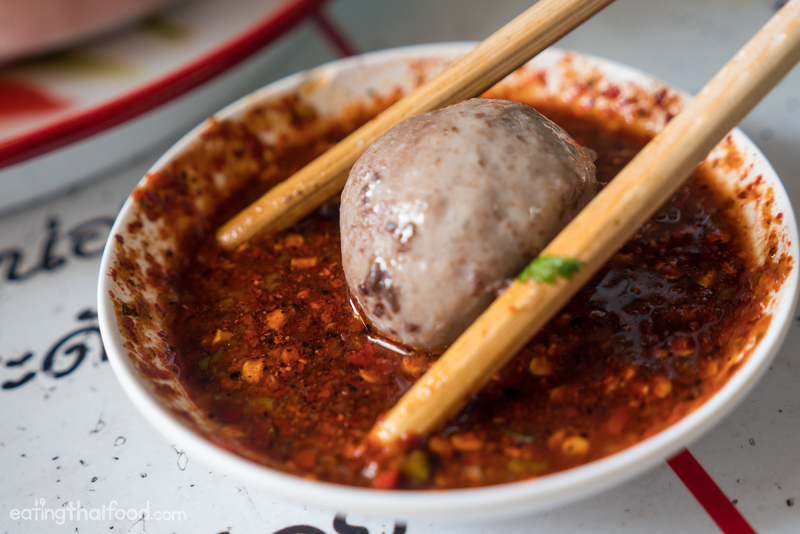 Is there any recommended beef balls + beef brisket place nearby thonglor / ekkamai area (or at least near subway)? Love your posts as always. Looks great! I’ll go try it soon!! Thanks Mark! 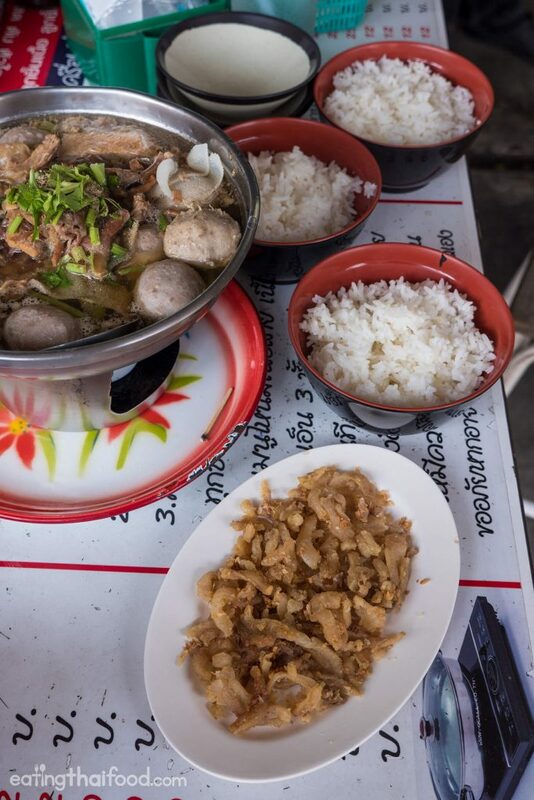 My long time favorite is the old grandmother who has a braised beef shop on Phra Athit across from the park. I noticed that in this post you didn’t include the phonetic translations, I find those really helpful when I’m ordering. Please don’t stop including those!